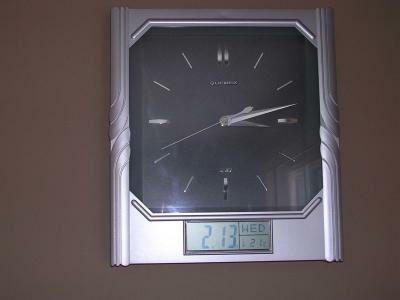 This clock was a wedding present from my uncle in toronto. My uncle bought a different present for us before he left Toronto. He put it in his luggage and when he arrived in Winnipeg, Air Canada had lost the bag with our gift in it. He was upset, but in a hurry to get another gift. He went to the nearest mall, and purchased this clock. He said, "I was pressed for time, and a clock was all I could think of." The clock is great. It tells us the date, temperature, and the time. It is funny, because many people mistake the digital reading for the clock, which is actually the date, to be the actual time. Even I have made that mistake. This clock has never had it's battery replaced in 5 years...so it is reliable too. A great gift.